If you’re looking for a fun holiday crafting idea that you can EAT afterwards, then you should really try Watercolor Cookie Decorating. I recently took a CraftJam.co class on this subject with Carney and we had a blast! Our class was taught by Minnie Lane and she was so great, teaching us watercolor techniques and fresh new ideas for our cookie designs. Here’s a quick rundown on how to decorate your own cookies with custom watercolor artwork. Cookies – if you are baking them yourself, make sure they are fully cooled. Flat cookies (like a sugar cookie or ginger snap) will have a better result than something with bumps (like a chocolate chip). Clear Vanilla Extract – get a decent sized bottle. Frosting – white/vanilla is recommended since it will be less noticeable under the fondant, but get crazy if you want. Circular Cookie Cutter – smaller than the size of your cookies. Paint Palette – make sure it’s unused! Actual paint is not edible! Or, just use little saucer dishes or small pyrex… but it’ll get messy. Paint Brushes – again, unused! An assortment of brush sizes will give you lots of options, but I found the smallest sizes to be the easiest to use. So you have your baked (or store-bought, there’s no shame in it!) cookies ready to be decorated, your fondant sitting nearby in a lump, clear vanilla extract and food coloring ready to be mixed on your palette. But wait! Don’t jump in! Plan your designs first. You’ll thank me later. Grab some drawing paper (thick though, because you’ll be painting food coloring on it) and draw some circles with a pencil to be used to mock up your designs. The first thing you’ll need to do is start mixing the food coloring watercolor paints. You can’t use actual water for this project (except to clean your brushes) because of how the water reacts w/the fondant. Spoiler alert: water will ruin this project! Drop no more than a teaspoon of clear vanilla extract into each reservoir in your unused paint palette. Then drop a teeeeeensy little drop of food coloring into each section and mix it with the vanilla extract. It might be hard to tell which color is which until you start painting with it, so make some mental notes. Pro Tip: If you find that the watercolor pigment is too diluted, add another drop of food coloring or use less clear vanilla extract. Play around with the hues and don’t be afraid to do some color mixing! That’s the fun of playing with paint, right? Once you have prepared your food coloring watercolor paints, you are ready to start practicing! Grab your scratch paper and try out some new designs. Our instructor showed us some pattern ideas and hand lettering techniques that work with watercolor. I thought the hand lettering was super hard to do using the water color brush! When you feel happy with your paint mock ups and have decided which designs you want to use on your cookies, it’s time to prepare the fondant. Knead the fondant as if it were dough, until it feels smooth and pliable in your hands. Then use the fondant roller (a regular rolling pin will work but it will stick to the fondant and leave less than optimal results) to roll out a thin layer of fondant. It should not be thicker than a half inch, and even that is a bit much. Nobody wants to bite into that much fondant lol! I tried to make my fondant about a quarter of an inch thick. With your fondant rolled out, use the cookie cutters to create nice little uniform round circles. Now it’s time to start painting! Take your time, breathe deeply, and enjoy the feeling of painting on fondant. It feels nice. Don’t press too hard or you will indent the fondant and it won’t look as good. Try out different techniques, like using different brushes, or trying to splatter paint for an interesting abstract look. If you TOTALLY screw up a design (you aren’t alone!) my CraftJam instructor Minnie says to take the messed up fondant circle and squish it back up into a ball and re-roll it out. The watercolor paint from your mess-up design will turn the fondant into a cool marbled design. You can use the new marbled fondant as your design instead, or paint on top of the marble for an even more complex design! Get crazy!! 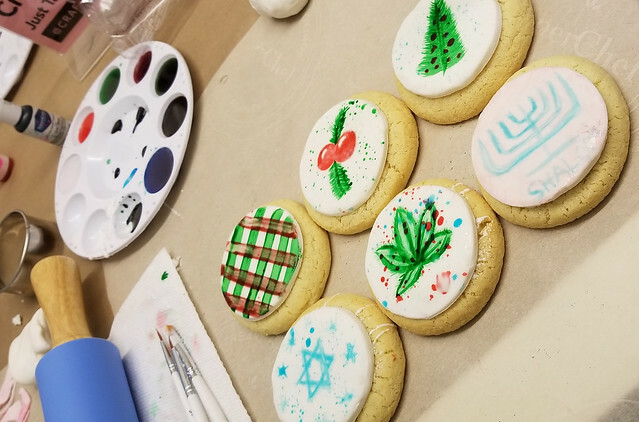 When your painting is complete, it is time to prepare the cookies. Put the painted fondant to the side to dry out a little and grab your cookies and frosting. All you have to do here is put a nice dollop of frosting on the middle of the cookie. The frosting will be serving as the adhesive to stick the fondant circle on top of the cookie. When your frosting is on the cookie, gently press the fondant on top and voila! Watercolor Cookies! Mine came out a little messed up. My paint splatters didn’t really come out the way I intended. The designs didn’t look exactly how I wanted. I was drinking beer and maybe rushed some things towards the end. But you know what? It doesn’t matter.